The definition of a goal is; the object of a person’s ambition or effort; an aim or desired result. My daughter, Hilary, set the bar high for herself, and achieved an awesome personal goal last month. 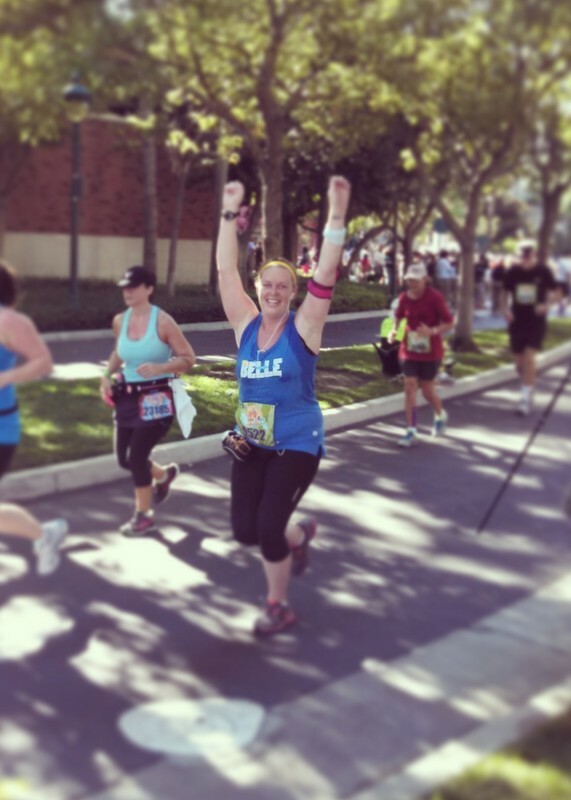 In January of this year Hilary boldly signed up to run in the Disneyland half-marathon at the beginning of September. This was Labor Day weekend by the way. No end of summer parties for this gal. 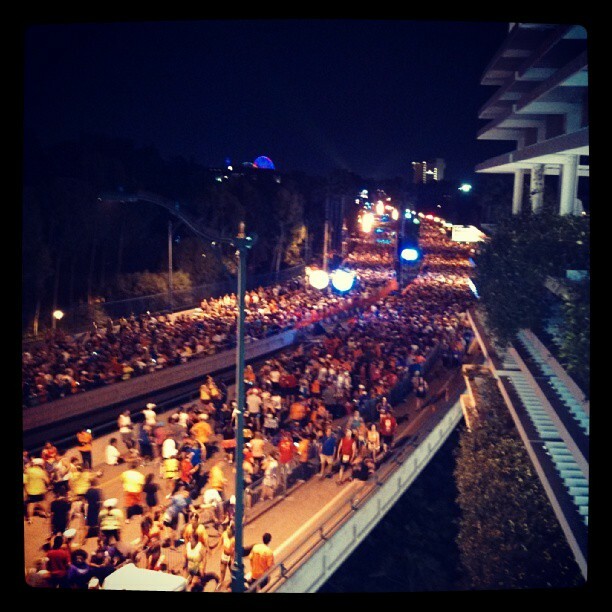 The starting line for the marathon. Get going Hilary – it’s only mile 4!! 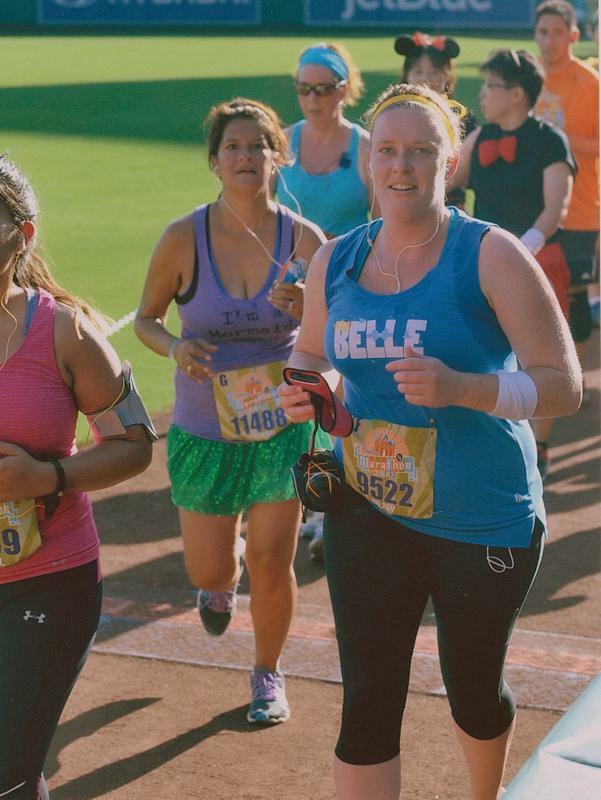 She joined a gym, changed her eating habits, and set the course for herself to run 13 miles start to finish. It makes me tired just typing that. As the date loomed closer Hilary became more determined than ever to get to the marathon, and get it done. She had every confidence in herself that she could do it, her mother of course was totally worried about her. That’s what I do. And by the way, she wasn’t running with friends or any of her sorority sisters, she did this solo, start to finish. No buddies to run with, and no family members by her side. Just herself and the pack of other runners determined to do what she was doing, and finish what she was finishing. Hilary’s cousin, Mary, made sure she got to the race venue on time, and was probably her biggest cheerleader for this event. The excitement and cousin love between the girls just warmed my heart. During the marathon, Hilary had to be able to stay within a 16-minute mile in order to stay in the race. She set a goal for herself to run a 13-minute mile and she did it, all the way through the marathon. 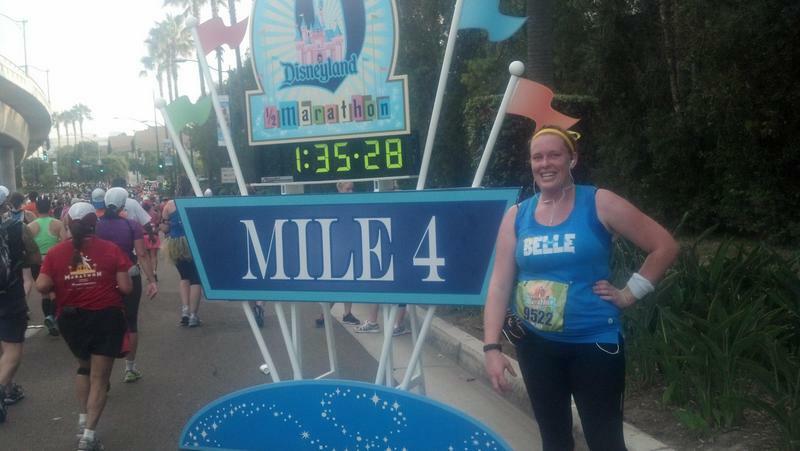 We were able to track her time, and milestones through an amazing system Disney had set-up for marathon day. My Mom and I were in awe of what she was doing. 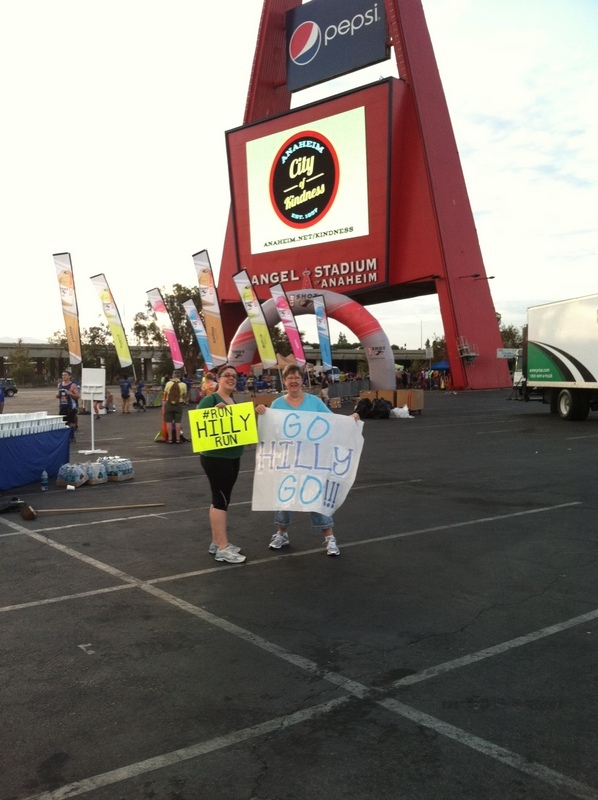 During the race we were able to scope out a spot in Angels Stadium parking lot to cheer her on. It seemed like we were waiting a lifetime for her to come around the corner and through an archway that was set up for the event. Thankfully we finally spotted her, and she stopped momentarily to take pictures with us, and then was on her way. I’m pretty sure I got a tear in my eye at this moment in time. Hilary’s cousin, Mary, and her brother, Bryan raced to the finish line to get a picture of her. Many, many thanks to Mary for sprinting through the race venue to get this shot. This picture captures all of the emotion of I set my goal, and I met it. My first hug with Hilary after she finished her race was filled with such happiness for her. As a parent, there is no greater joy than watching your kids set their sights on something, going for it, and making it happen. You set the bar high for this family dear Hilary. Congratulations to my daughter for stepping out there (no pun intended), and getting this done. Wow, there’s no other word to describe this, just wow! !